I am so excited to share with you one of my passions: Running Races (notice I didn’t say just running). Races are the one thing that makes me LOVE running. My husband and I ran the Salt Lake City Marathon last week and we loved every minute of it (well… maybe not miles 23 to 26). But we loved everything else! I didn’t start running races until I got married. My sweet husband convinced me that I would love it so I gave it a try. I ran a 5k and I really thought I was going to die. After that, I was determined to run more. I signed up for another 5k and I beat my time by 10 minutes. I was then officially hooked. As time went on I decided to train for a half marathon. It was hard at first but it really became easier with time. My first half was very slow, but I finished! I was so happy! I have now run 2 marathons about 15 1/2 marathons, many 10ks, 5ks, and I even finished a triathlon which I placed 2nd in. About 2 years ago I got a group of 20 girls and together we ran a 1/2 marathon. Some of these girls had never run more than a mile when we started. But they all did it! If they can do it… so can you! I am not a professional by any means. These are my own tips that I use when training! I hope they help! If you have never run, just had a baby, or haven’t run for a long time, I highly suggest trying the program: Couch to 5k. It helped many of the girls who hadn’t run for a long time! If you are already running, there are so many good plans out there! Now you just need to find one that is good for you. Some of my favorite schedules are from Hal Higdons programs. He has them for beginners all the way to advanced runners. I will admit…. I was one of those who would buy kids tennis shoes because I could fit into them and because they were much cheaper. My husband really laughed when he saw what I was wearing. He bought me my first good pair of running shoes and I have never gone back! They really make running shoes for the purpose of running. Some of my favorites are: Asics Kayanos, Brooks Adrenaline, Mizunu Wave Prophecy. My advice is to go to a running store and take a running/shoe test. They can tell you what shoes will fit you best. 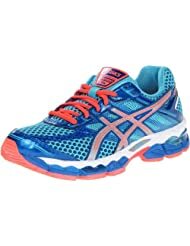 I like to look around for the best price (being on a budget and all) Amazon many times has crazy deals on running shoes! I love running with people. That is one reason I love running so much. It gets me out of bed if I know someone is waiting for me. This last year, my husband’s schedule was so crazy, I couldn’t run with anyone consistently. It was my first time training for a race all by myself. It was hard at first but after awhile I began loving the alone time. I also loved listening to my music. My husband would run the long runs with my thankfully. My other favorite running partner was my running watch. It showed me how many miles I had gone, my pace, and some even show your heart rate. My favorite running watch is a Garmin – but be sure to check other watches out so you can find one that fits you. 5. Your long runs can be slow… it is okay! When I trained for my first marathon, I was so worried that my long runs were way to slow. There was no way I could run faster and longer in one race. Wrong. It is okay that your long runs are slow, in fact, you want them slower than you are going to run in your real race. If you pushed them hard and fast there is a good chance you will get injured, and a good chance that you will be burned out. When you are done running a long run, fill you bath tub about 1/2 way up with freezing cold water. Once it is filled 1/2 way, turn on your shower to hot. Climb into your freezing bath and sit in the freezing water while the hot water sprays from your shower onto your head. I try and stay in there for 5 to 10 minutes. You will notice a huge difference in your legs when you are one with your ice bath! I highly recommend it. I also mention recovery. After a long run, it is very important to take the next day off and recover. Your legs will need it and your body will too! Sometimes on long runs it is hard to stay hydrated. The night before a long run, we would go and drop water along our route so that we could get a drink. You could also pick a route that has a few drinking fountains or water stops in it. With this last run, we used something called the BottleBand. It may look like a simple product, but my husband and I loved it! It can fit onto any water bottle, big or small, and it makes it so much easier to carry your water. When my husband and I went on trail runs where we couldn’t drop water, we always brought our water with our bottleband. It is also very important to drink water before and after every run! Nutrition is an important part of training. Eating healthy will make the runs much easier and you will just feel better! We usually eat pasta or carbs the night before each long run (here is a list of my top pre-race pasta meals). We would also try and eat or drink some protein after each run so help build back some of our muscle. My favorite is chocolate milk. I look forward to it after each run! I like to eat a piece of toast and 1/2 of a banana about 2 hours before my race starts. My husband likes a tiny bowl of cereal. Practice when doing a long run what your body needs so you will be good to go race day morning. Go to the bathroom twice or even 3 times. You want to be as empty as you can get before you start running. Get to the starting line early. I like to get there about 30 minutes before it starts so I can stretch and make one last potty run. Start out slow. Everyone gets so excited at the beginning. Keep a slow steady pace and you won’t be completely dead at the end. Lets be honest… you probably won’t win the race. Which is still awesome! The majority of runners don’t run to win the race. They run to be fit, active and to beat their old time (Those are my reasons anyways). Take a minute and look around you before the race begins. It truly is an amazing feeling being by thousands of people who love to run, just like you! Good luck with your race whether is it your first or your ninety-first! Runners Unite! Great advice. Although I'm a little surprised you would recommend taking advantage of local resources and the expertise of a local running store, but then you don't suggest supporting them buy making a purchase there. I agree, you can find great deals on running shoes online, but we will lose our local resources if we don't support them by making a purchase after we have used their time and expertise. I don't own a running store, just an avid runner. I love the advice you give and enthusiasm you show for running. That's awesome. However, I second the comment about the running stores. As somebody who works at a locally-owned running store, I'm sad to see you suggesting that people use running stores' expertise and then buy shoes elsewhere. As I'm sure you know, good running stores offer great advice and support. Please rethink suggesting that people don't return the support. I'm sorry if I offended anyone! I love all the local running stores! I have bought many shoes (and many other items) from running stores. Being on a tight budget for the last 8 years of my marriage (my husband will graduate Medical School in 3 weeks! ), I have to find good deals on shoes. I'm just suggesting to look around - and looking also includes at your local running stores. Thank you for your comments! No worries! I totally get the tight budgeting and am right there as well...just wanted to say something in support of the local running stores. Thanks for spreading the word on the benefits of running and good luck with your future races! This is GREAT advice! I also run because I love races! The atmosphere is always so much fun no matter how big or small the race! I agree with your Race day suggestions...and would add "start out at the back of the pack." I made the mistake at my first race of starting at the front of the crowd and it was really disheartening to be passed by little kids, old ladies, people pushing strollers and juggling clowns (for real)! Thank you! :) And yes... starting in the back is smart! :) Thanks for you comment! Good Luck! You are going to LOVE it!!! So I'm betting you can clear up my confusion. Your advice (#2) about not starting half marathon training until you can run 3 mi easily is something I've heard before. But then you (and others) also say so start w/couch to 5k training. So how did the girls in your group that were not runners train? Do you just recommend following the couch to 5k & know you won't run the whole 1/2 marathon? I can run 3 mi but it's very difficult! I've slacked (sickness & out of town) on my training & find myself with only 8 weeks left. My original goal was to run the whole thing, but I know that's no longer realistic, doing 3 training runs/week. So any advice? I haven't officially signed up for the race & I'm questioning if I even still should. Kristen! You are so awesome! Thanks for the shout out and what a great post!! Why don't we live closer so we can run together!!!! Boo hoo! Love you tons!